Have you ever had those days where you don't feel like talking much? I'm having one of those days. I'm not sad or mad I'm just tired, and in all honesty, I want to just snuggle up with my book and fall asleep. I'll leave you with these parting words... these Rag and Bone jeggings are God's gift to mankind... and by mankind I mean womankind... and by womankind I mean me. If you haven't noticed by now, these next few posts are another weekend packing saga. I generally try not to wear the same exact articles of clothing several days in a row (unless under dire situations). Dire = carrying a heavy bag to Long Island (just in case you were confused by my definition of dire). great outfit and accessories. I especially love that wrist cuff and blue ring. Love love love that silver eagle cuff! That is amazing! Great outfit, great blog, very inspiring! You have the BEST jewelry! Love the necklace...and the cuff and your shoes. And the jeggings....divine! Great outfit. Now, go curl up with that book. Love how you jazzed up the outfit though, the necklace, the sunspecs, the bag! Awesome! hi, i really like your blog! check out mine and maybe we can follow each other! I love this simple outfit. Your cuff is to die for! Love the KW sunnies too! i'm obsessed with that cuff! OOF! 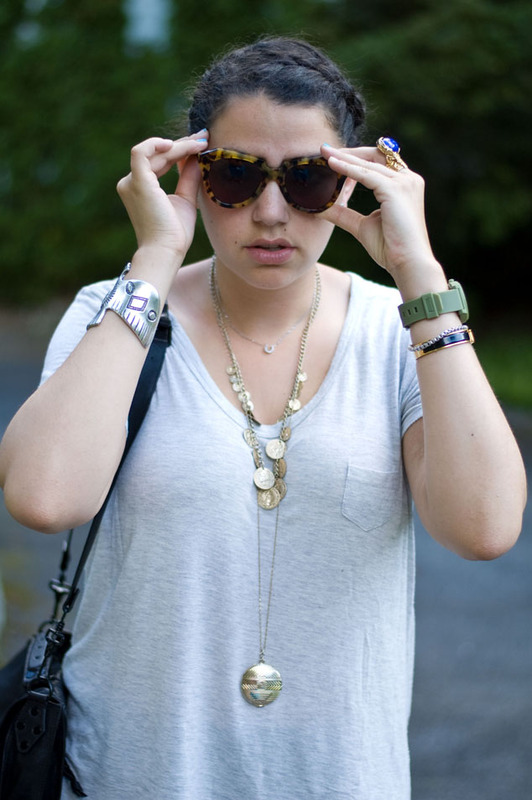 I SWOON for that PS 1.
i love those karen walker sunnies! they're actually on my list of things to buy at the moment hence my latest post on tortoise sunglasses. they look great!